This guide is an introduction to the Menu Panel present in web sessions. It illustrates the functionalities available via the Menu Panel during a connection to the remote or virtual desktop. 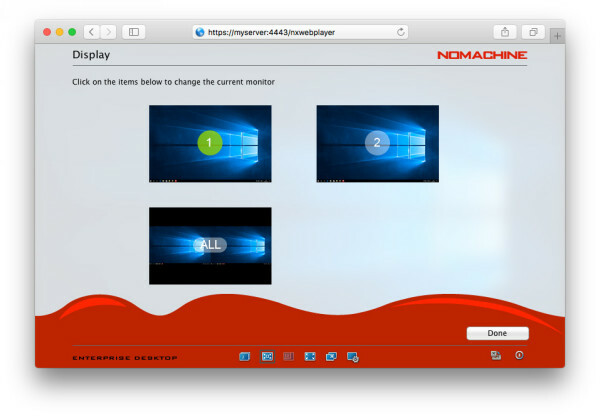 In this document we refer to 'web player' to indicate the NoMachine application which runs sessions via web and displays the graphical interface of the web client. 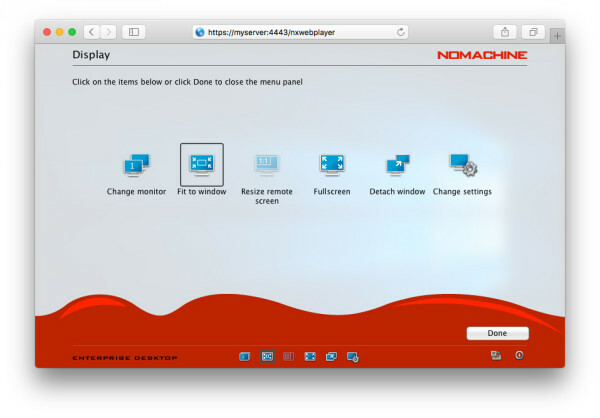 For guidance on installation and configuration of the software, please consult the Installation & Configuration Guides available on our website: https://www.nomachine.com/all-documents . The Menu panel is a panel which you can open during the life of your remote connection to give you access to a number of features and functionality ranging from virtual keyboard, multi-media, screen capture, and more. It is designed to be consistent across operating systems whether you are connected to Mac, Windows or Linux. The functionality of the panel should look and work similarly in all browsers. This Guide will explain what the icons in the screenshot below (Input, Display, Keyboard, Clipboard, Connection) represent, how to interact with them and which are the settings available in their respective panels. Once you are connected to the remote desktop enter the key combination Ctrl+Alt+0 or move your cursor to the page-peel in the top right-hand corner of the window to access the Menu Panel. Settings to open the menu can be changed according to your own preference. Proceed to section 'Input Panel' to learn more about configuring the page-peel and hot-key combinations to meet your own requirements. Click on the Input button icon to access the settings panel for the Input section. The above panel lets you fine-tune mouse and pointer activity, as well as set menu appearance, language to be used or keyboard shortcuts. Show remote cursor pointer This option gives the ability to see the mouse cursor on the desktop of the remote host where the user is connected. Show clipboard when text is selected Automatically opens the NoMachine virtual clipboard when a text is selected inside the session. It allows to copy text content between the remote desktop in the browser and the user's OS (both directions). Show the menu panel covering all screen Choose how the menu should appear, covering all available window space or being an overlay. This can also be set at session startup: a welcome page presents the possibility to choose between 'Display the menu panel covering all screen' and 'Display the menu panel as a window'. Click on 'Don't show this message again to no longer be prompted about this option. Use page-peel for menu access Disable or enable 'Page-peel' and choose a corner that won't interfere with your browser or file commands (top right, bottom right, bottom left or top left). Hovering over the corner to display a page curl effect will quickly pull up the Menu when clicked. Check 'Use action icons' in the page-peel' to show the following buttons: Change monitor, Fit to Window, Resize remote screen, Fullscreen, Detach window and Change settings in the page-peel. Style The web player graphical interface has got two themes, Sunshine (bright, white) and Moonlight (dark). By choosing one of them, the look of web player switches to the selected one. Wave Set the color of the wave at the bottom of NoMachine menu. You can choose among red, light gray and dark gray. Text Choose the language for the web player interface. English, German, Spanish, French, Italian, Polish, Portuguese and Russian ar available. The web player adopts the browser'Fdiss language at first session startup. You can then choose a different language, it will be used for all successive sessions. Use Dvorak keyboard layout Set the Dvorak simplified keyboard layout in the NoMachine virtual keyboard (depending on OS and browser). Resize the panel to fit the browser window Resize content of menu panel to fit the window. Show scrollbars when viewing part of the desktop Enable or disable showing scrollbars when only a partial area of the desktop is displayed. Use hot-key for menu access Check the box to use hot-keys to open the menu. Key combination to open the menu is set to Ctrl-Alt-0 by default. Click on 'Change' to assign a different shortcut for entering the web player Menu. Additionally you can personalize keys to be used for the available shortcuts. Click on 'Shortcuts' to see them and assign different key combinations. E.g. by default ctrl+alt+T terminates the session and ctrl+alt+K opens the virtual keyboard. The Display panel lets you change view mode for displaying the remote desktop and adjust display settings to optimize the visual quality. It provides a number of button icons explained in detail in the following paragraphs. This icon appears only when you are connected to the physical desktop and multiple monitors are detected on the remote side. It lets you switch among the available monitors, for example to access applications which are running on different monitors. 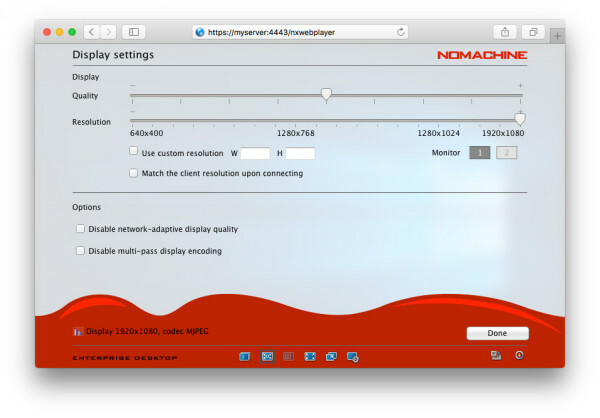 When connecting to the remote desktop, NoMachine detects that there are multi-monitors and will show their number accordingly. Use the Ctrl-Alt-I shortcut to quickly identify which monitor has to be shown. Enable or disable showing the session content at the same size of the remote display. 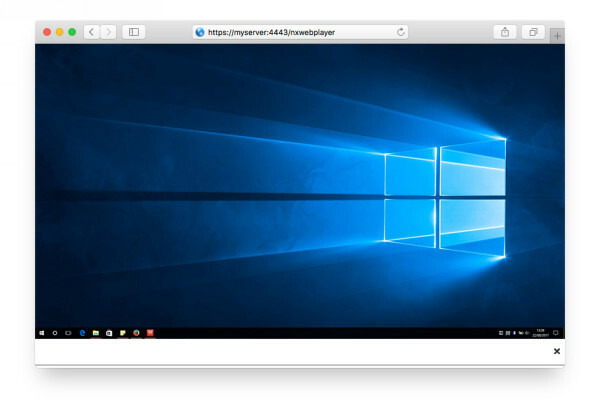 'Fit to window' is disabled by default, a viewport lets you move within the session when the remote desktop is bigger than the browser window (point your cursor to the window's edge to navigate the viewport). When 'Fit to window' is enabled, content of the remote desktop is stretched or shrunked to fit the browser window. Enable or disable resizing the remote window. It's disabled by default. 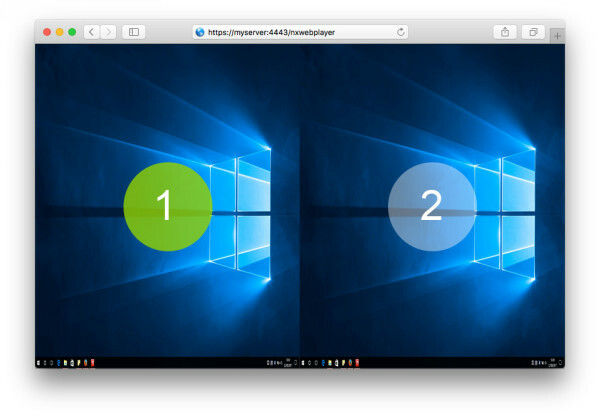 When 'Resize remote screen' is enabled, changing the dimension of the session window will resize the remote desktop to always fit the dimension of the browser window. Disabling 'Resize remote screen' will let you resize the window without scaling the remote desktop. Send your browser to full screen mode. Click on the Fullscreen button icon in the menu to exit the full screen mode or use your browser's shortcuts. Open the web session in a new popup window, it allows you to detach the web session from the main window of a browser. Default settings are suitable for most situations. In some cases, however, for example when using particular applications or when network conditions are disadvantageous, adjusting display settings may improve your session experience on the web. Use the slider to change the image quality according to your preferences. By default it is set to the middle value. By sliding it to the right, a higher quality of image is obtained (+), with more data being encoded and transmitted. This is best suited for network connections where bandwidth is available. On the other hand, if you want to consume less bandwidth, or your network conditions are not optimal, try moving the slider to the left (-). Data will be compressed as much as possible to save on the amount of bandwidth consumed without compromising on the speed at which data is being passed. A further option 'Match the client resolution upon connecting' defines whether the server resolution has to be changed to mirror the client desktop dimensions every time the user connects to the remote desktop. It's possible to set this behavior also in the welcome panel for Display settings issued at session startup. Click on 'Don't show this message again' to be no longer prompted with this option. Set resolution preferences per display in the case of connections to the physical desktop. The list of monitors (1, 2, etc ...) reflects the number of monitors attached to the remote side. Disable network adaptive display quality - checking this option will not disable the progressive refinement of the image, but will anchor the lowest quality to a fixed value, making it independent from the current network congestion. Not recommended when there is very limited bandwidth. The target quality will remain in any case the one specified in the Display quality slider. Disable multi-pass display encoding - default settings within the encoding will work to refine the image progressively to the target quality (as specified in the Display quality slider) starting from a lower quality version of the image during moments of inactivity of the desktop. Disabling this refinement sends the image directly with target quality. Not recommended when there is limited bandwidth. Display 1366x768, codec MJPEG. Other encodings like VP8 and H.264 can be supported only when WebRTC (Real-Time Web Communication) is enabled and the browser supports them. 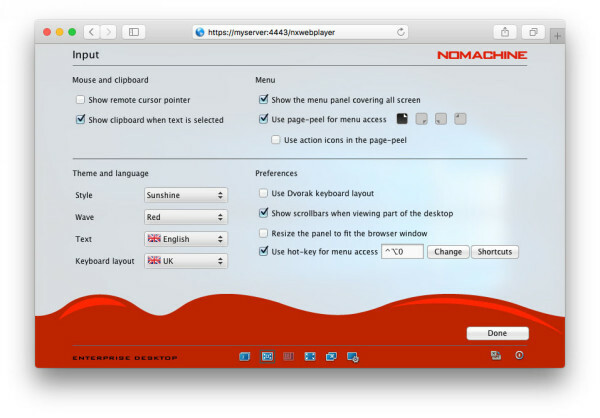 Clicking on the Keyboard button icon in the menu will open the NoMachine virtual keyboard to be used within the remote desktop. There are numerous regional keyboard layouts to choose from. US, UK, Polish, Italian, Spanish, Swiss, Russian, Portuguese, German, French, Farsi, Dutch, Czech, Belgian, Norwegian and Arabic. Pressing a virtual keyboard key triggers a keypress on remote desktop host (virtual or physical). Some shortcuts, like the Windows key, cannot be caught in the browser since they are intercepted at the Operating System level. The virtual keyboard can be used instead. 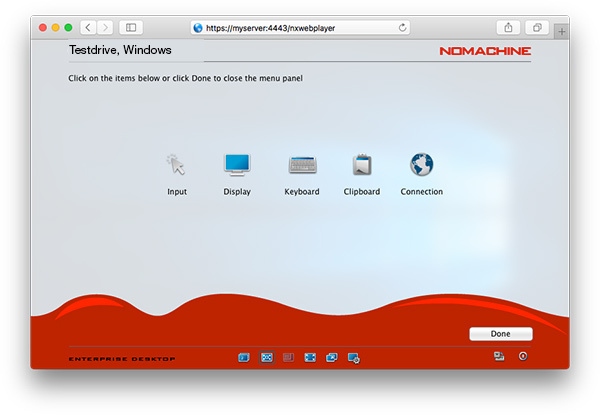 Click on the Clipboard button icon in the menu to open the NoMachine virtual clipboard. Due to browser capabilities, it's not possible to transfer text content between the NoMachine session and the local computer directly. It's necessary to rely on the virtual clipboard. When option 'Show clipboard when text is selected' is turned on in the Input Menu, every time you select some text in the session, the clipboard automatically opens with the selected text already inserted. Copy the text in this clipboard: you will then be able to paste it to your device. To copy text from your device to the session, select the text on locale, open the NoMachine virtual clipboard and paste the text. Then copy it from the clipboard and paste the text inside the session. 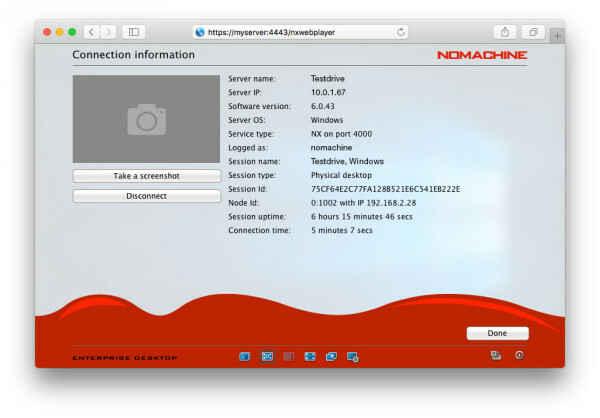 Find out basic information about your remote session, including NoMachine software product & version, server name, IP address, user name, session name, since how long the session has been connected and more. Additionally you can do the following. 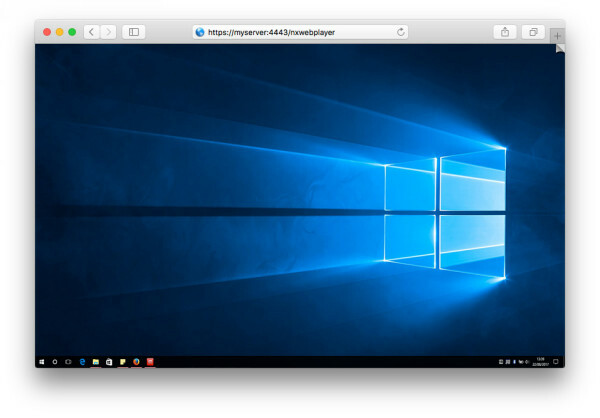 This tool lets you take a screenshot of the remote desktop. Screenshots are saved in the download folder as set in your browser. Retrieve the NoMachine statistics for the current session. Statistics mainly provide information about bandwidth usage. Click on 'Disconnect' to disconnect the NoMachine session. You will be taken back to the NoMachine log-in. On the far right there is also, from left to right, a button to send the Ctrl+Alt+Delete key combination when connected to a Windows desktop and the Disconnect button. Hover any of them with the mouse to display their tooltip.